I guess I’d ask Stephen the same question he asked on Hapgood a week or two ago about Connectivism — he says people are saying F2F institutions are safe from the effects of the digital, networked revolution — but who exactly is saying these things? Links? It seems to me that most people think some portion of learning will go online and some portion will be F2F. Some institutions will close soon (the Borders of HE) some will take longer, some will never close. The actual argument is not around whether this will happen, but how *many* will close, what the new configuration looks like, and what the timeframe of the change will be. And rightly so! Seeing 20 years into the future is not trivial. But seeing five years into it is much harder. Yet helping our constituencies requires the five year vision more than the twenty year one. 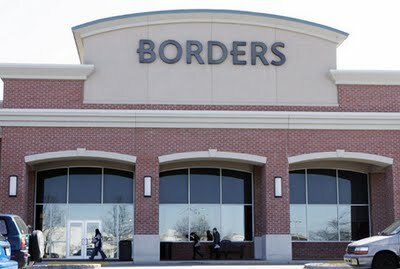 The question isn’t whether some bookstores will close — the question is how one avoids being Borders. I’m not saying there won’t be radical change. My experience is that things don’t change for much, much longer than you think, and then they change rapidly all at once. Tech is definitely a tipping point phenomenon. But isn’t that what most people are saying? I spent this summer at a conference with hundreds of state college provosts from around the country — and I don’t think I talked to a single one that didn’t realize figuring out how they meshed with online education was the key to their institution’s continued relevance. So who are these people that think differently about this? It’s easy to believe that the student protests against tuition, at least at the state colleges, might at least stall the tumble of state appropriations. I think it’s unlikely. In fact, I think the net effect of the tuition protests will be a crackdown on college cost, not to the student, but to the taxpayer. And the recent statements of Arne Duncan seem to confirm that’s the game plan at the federal level. It doesn’t matter that U.S. students, on average, might pay less for college tuition than they did ten years or even fifteen years ago. To the extent that’s true, it’s made possible by a government subsidy — one which is hitting it’s ceiling. Add to that the gray wave that will eventually defund education and the direction is set. So if you are cheering on student protests because they show a generation finally willing to take control of their political destiny, keep cheering. I am too. But if you think the net result will be a greater and more equitable funding of education, think again. That student momentum has already been jiu-jistu’d back at us, and it is just going to get uglier from here on out. (Sorry about the graph… it’s just huge). The time a student must or should spend on their studies is also related to the subject studied. 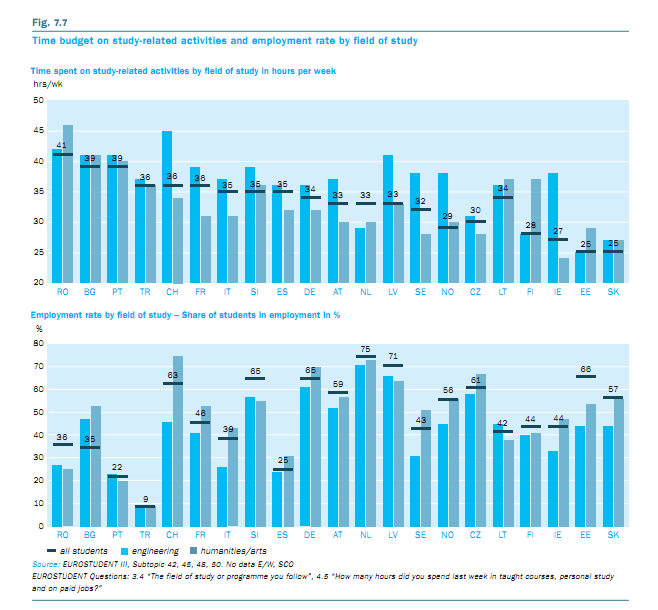 The EUROSTUDENT dataset presents an insight into this link by contrasting students from two particular subject areas – engineering and humanities students. In most countries engineering students follow a learning-intensive and highly structured curriculum which requires higher presence and investment in study time than less structured ones like the curricula for courses in humanities and arts. The higher degree of freedom and more personal studies in the “soft sciences” make it easier for those students who have to earn money to combine study and employment, even if they are formally enrolled as full-time students. In most countries where study-time invested in humanities and arts is lower than for engineering, employment rates are higher for humanities students. There’s a more readable resolution graph in the report, plus lots of other goodies for anyone looking to escape educational policy provincialism. It’d be interesting, of course, to see whether the student employment association holds up in the U.S., though given that it’s Friday, I’ll leave that to someone else to do. People, I believe, intuit that the STEM fields are good majors. But I think that’s not just, or even primarily, because of their intrinsic merits. The fact that these programs are hard and the people in them tend to spend a lot of time studying is an important part of the story. By contrast, majoring in “business” sounds very practical-minded to a lot of people. After all, how could a business degree not be more valuable than some nonsense like philosophy? That’s one of the reasons why it’s become the most popular major by far. 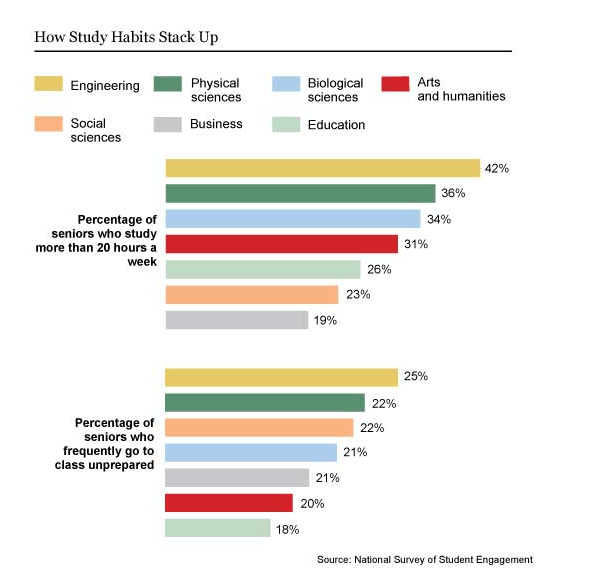 But business majors aren’t actually doing anything! Not surprisingly, in exchange for doing less work than people in other majors, business majors also learn less. On the whole, I think Yglesias is right. It’s not a good major/bad major problem as much as a broken set of expectations. If Philosophy is a demanding degree on your campus, your Philosophy majors will be better prepared for the workplace than graduates of a substantially less rigorous professional program. In the U.S., average debt at graduation rose to $25,250 in 2010, according to a Nov. 3 report by the Project on Student Debt. Here in Canada, students were graduating with an average debt of $26,680 according to a 2009 report released by the Millennium Scholarship Foundation. If anything, the Canadian average is higher now. The numbers seem almost impossible: isn’t tuition ridiculously high in the U.S.? The explanation that follows won’t be a surprise to readers of this blog — the high tuition sticker prices in America bear little relation to the cost of education. Whereas much of Canadian aid goes to the institutions themselves, most American aid is provided on the other side of the price tag with direct-to-student aid in the form of tax breaks and grants. This shift in where the discounting is applied has accelerated in the U.S. over the past 10 years, with state’s institutional funding falling away as federal direct-to-student funding has increased, with the odd effect that while the 10 year cost to students is fairly stable for state institutions, the sticker price has increased dramatically. Part of me thinks there’s a conservative genius at work here in America with the restructuring of student aid — the shift gives the appearance of out of control institutions with runaway spending in deep need of fiscal conservative tough love. We’ve got problems, sure. But that narrative is not quite right. Update — I just noticed this was a CCAP study. So forget the study —Vedder’s little conservative lobbyist think tank does the sloppiest work around, and I am pretty sure this study is no different. I regret having given it (mistakenly) any publicity at all. I do wish the Chronicle would stop publishing CCAP’s press releases though. It occasionally looks like news, which leads to all kinds of confusion. 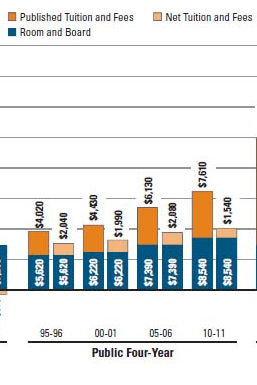 Despite the widely publicized rising sticker prices on tuition, about two-thirds of the increase in the cost of attending a four-year college from 2000 to 2009 came from nontuition sources, such as books and off-campus room and board, according to a report released on Thursday by the Center for College Affordability and Productivity. The average amount that students paid, after subtracting savings from scholarships and grants, increased by nearly $3,000, while net tuition prices grew by only about $1,000 over roughly the same period. Again, the story most people get on rising college costs is radically simplified. Most people are surprised to hear net college tuition cost for state institutions has barely budged in the past decade (if you take into account increased federal aid, and shifts from direct funding to things like tax breaks). I’m not saying we don’t have major problems. We do. But it’s important to know precisely what those problems are and what is causing them. I’m not sure how we can solve them otherwise. Regarding the story above, one of the things I have been thinking about lately is whether a semester long housing experience could be broken up into shifts, and combined with blended instruction. Group A comes up for weeks one and two, is home for weeks 3 and 4. Group B comes up for weeks three and four, is home for weeks one and two. The residential experience is so important to college, but there is, I suspect, some diminishing returns involved over the course of the semester. Why not treat that time on campus as a valuable commodity instead of as a generic experience? Adding… I think the textbook angle goes without saying — open textbooks is an access issue, full stop, end of story. Time to get this done. But thanks to a tweet by Mike Caulfield almost two years ago, I finally had a way to think UMW Blogs’ relationship to FERPA differently. Mike basically noted that by giving students their own spaces online wherein they control their online identities, decide what they will share and won’t, and take control over the disclosure of their own data we are more FERPA compliant than any other system on campus. In fact, that’s exactly right, UMW Blogs is focused on giving students control over their own learning process, reflections, and take back ownership of their data. What could be more FERPA compliant? I think it is time to reclaim the FUD around FERPA and reinterpret it as it was intended: an act that encourages universities to give students more control over their own data, and by extension their own teaching and learning. Fact is, FERPA is in many ways a parallel toGardner Campbell‘s idea of “student as sysadmin of their own education” —that is what we should be actively pursuing as a community dedicated to teaching and learning in the open rather than heading down a road of prohibition further alienating higher education from its mission. FERPA is about a student’s right to control the publishing of records and products associated with their education. So is Web 2.0. So where’s the problem? That insight came out of a meeting we had with the Registrar to try and solve the problem once and for all. And to our surprise, the argument hit home. I do want to make sure that the whole CELT team gets credit for that though — Jenny Darrow (@gobman) was the one that took the initiative to meet with the Registrar and talk FERPA. And after we suggested suggested creating FERPA/Web 2.0 boilerplate for syllabi that even the Registrar could live with, Matthew Ragan (@raganmd) took on the arduous task of the revision/buy-in cycle. For issues that relate to “being public”, that accommodation can be agreed on between the student and the professor. It could involve the use of pseudonyms, or an alternative non-public assignment the student could work on. The professor should always state this in the syllabus, so that students understand they have the option to request this. For issues relating to grades, or official records, there is a much more rigid line. Under no circumstance can any official educational record be divulged without explicit written permission of the student, specifying exactly the people to whom the record will be released. Professor comments on blogs are not, in most cases, official student records. They are not information maintained by the college, not part of any permanent assessment, and as long as they do not mention grades, etc., are probably best seen as ephemeral notes or classroom comments. Here’s an interesting point I hadn’t thought of before the meeting: if you can’t do it on the web because of FERPA, you can’t do it in class either. FERPA makes no distinction between revealing elements of the educational record to a students classmates and revealing them to the greater web. A comment that related to a student’s grade that was illegal on the web would likely also be illegal in the classroom. If you can’t force students to post their art on the web (and you likely can’t — you have to provide an alternative to those who ask), you can’t force them to post it in the school’s hallway either. That last point is pretty key. If your students watch each other present material in class and comment on their presentations there is no basis for a legal distinction between them doing that in class and them doing it on the web. FERPA is web-neutral, or, more exactly, web-ignorant. There is no legitimate distinction to be made between divulging an educational record to a classmate of a student and divulging it to an outside party. The Registrar actually gave the example of hanging student artwork with names out in a hallway. You can’t require that students hang named artwork in a hallway. Does that mean you can’t have students hang named artwork in a hallway? No — it just means that if a student requires accommodation (for instance, if a student is attempting to avoid letting a stalker know what classes she is in) that you work with the student to provide an alternative that will not adversely impact their grade. Again – I can’t repeat this enough. There’s no legal difference between the hallway and the web, no difference between the oral presentations your students give and their blog posts. None. The wonderful thing is, as Jim mentions, in a Web 2.0 context this is a learning opportunity. The choice to publish under a real name or a pseudonym is one that students can consider (no matter how much Google Plus tries to take that decision away from them). Understanding their rationale for that choice and choosing a strategy to implement it is not just an issue of classroom management — it’s one of the key learning outcomes for a course.